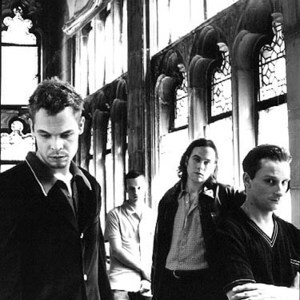 Big Wreck was a neo-progressive hard rock band of the late 1990s. The band was formed in Boston, Massachusetts in 1995 by vocalist Ian Thornley, guitarist Brian Doherty, bassist Dave Henning and drummer Forrest Williams, who met as students at the Berklee College of Music. After several years of gigging in Boston and Cambridge, the band signed to a major label and released its debut album In Loving Memory Of... in 1997. The single The Oaf was a major Top Ten hit for the band that year. The band was formed in Boston, Massachusetts in 1995 by vocalist Ian Thornley, guitarist Brian Doherty, bassist Dave Henning and drummer Forrest Williams, who met as students at the Berklee College of Music. After several years of gigging in Boston and Cambridge, the band signed to a major label and released its debut album In Loving Memory Of... in 1997. The single The Oaf was a major Top Ten hit for the band that year. Thornley moved back to Toronto, launching the band Thornley. Doherty has gone on to be in the indie band Death of 8, but the other band members never emerged with new projects. Subsequent 2012 Canadian tour announced.